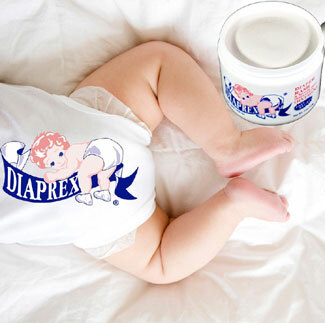 Trusted by moms for over 50 years, Diaprex Diaper Rash Ointment heals and protects skin. One of the first diaper rash creams on the market – right here in Michigan – Diaprex is hypoallergenic to help soothe and calm the skin. With subtle hints of vanilla and cinnamon, the Balsam of Peru provides a pleasant, inviting aroma. Both hypoallergenic and naturally fragrant, this diaper rash ointment will not irritate skin. Diaprex is supplemented with S?the™, a natural complex consisting of the purest beeswax, lanolin and castor oil to promote healthy skin. Diaprex Diaper Rash Ointment uses only USP grade ingredients of the utmost quality and is exclusively manufactured in a laboratory-tested FDA-compliant environment where consistency, safety and integrity share equal responsibility as Diaprex’s highest priorities. Diaprex incorporates two active ingredients; zinc oxide and white petrolatum that together act to create a potent barrier between your Baby’s skin and the moisture, urine, and stool found in the diaper area. Healthy skin barrier function is essential for the prevention and treatment of diaper rash. Skin also needs the proper amount of hydration to be healthy. Dry skin is caused by a loss of hydration (water) in the upper layers of the skin. To maintain hydration, Diaprex incorporates a complex of 3 natural emollients (lanolin USP, beeswax, and castor oil) called S?the. Emollients are substances that soften and moisturize the skin while decrease itching and flaking. S?the helps your baby’s skin achieve and maintain healthy hydration levels. And lastly, Balsam Peru is a natural fragrance which gives Diaprex a pleasant smell. Balsam of Peru is not only used for its aromatic properties but also for its mild antiseptic, antifungal and antiparasitic attributes. It has 3 main uses: fragrance in toiletries; flavoring in food and drink; healing properties in medicinal products. The Diaprex Diaper Rash Ointment story spans generations of Mom’s and their babies. The story begins over 50 years ago with the inventor of the product, Belle Moss, a pharmacist at Detroit’s Children’s Hospital in Detroit, Michigan. Diaprex is the brand trusted by moms and physicians to gently protect and heal the delicate skin of babies. Diaprex quickly became the favorite Diaper Rash Ointment in the midwest. It has been, and remains a beloved brand for generations of moms, dads, and physicians for their loved ones and patients. Belle Moss formulated Diaprex decades ago. Regional physicians and pediatricians rapidly endorsed the formula, making Diaprex the number one recommended diaper ointment for decades. It became a local and regional favorite, but as time went by, the product slowly vanished from the market. Soon, the letters and testimonials began flowing in from mothers, grandmothers, and even men, who all expressed similar sentiments: “I was a Diaprex baby!” and “There really is nothing on the market like Diaprex!” and “This is the only product that truly works for diaper rash and wound healing.” Froehlich often receives messages from excited callers who are overjoyed to rediscover the source of Diaprex because they have literally been searching for this product for over a decade. This diaper rash ointment gently heals and protects the delicate skin of newborn babies and children. Both hypoallergenic and naturally fragrant, Diaprex will neither irritate your baby’s skin nor leave them smelling like they just crawled out of a medicine cabinet. With subtle hints of vanilla and cinnamon, the balsam of Peru is what gives Diaprex (and your baby) a pleasant, inviting aroma. Diaprex is supplemented with S?the™, a natural complex consisting of the purest beeswax, lanolin and castor oil to help soothe and calm skin. A dry bottom is your baby’s best defense against diaper rash, so in addition to changing your baby’s diaper as soon as possible after it becomes wet or soiled, remember to air dry or pat your child’s skin dry (never rub) and, then, be sure to apply a thin layer of Diaprex on their bottom after each change. Originally invented during a time when cloth diapers were the only option, Diaprex was an innovation in helping to keep babies dry. With both the moisture-absorbing technology of the modern diaper and the amazing abilities of Diaprex working together, discover how protecting your baby from diaper rash has never been more effective or easier. Order Diaprex today!